One of the oddest caps in my collection is one I didn’t know anything about until a comment from friend to the program Louis Griffel revealed to me that this cap is indeed a Turn Back The Clock cap. 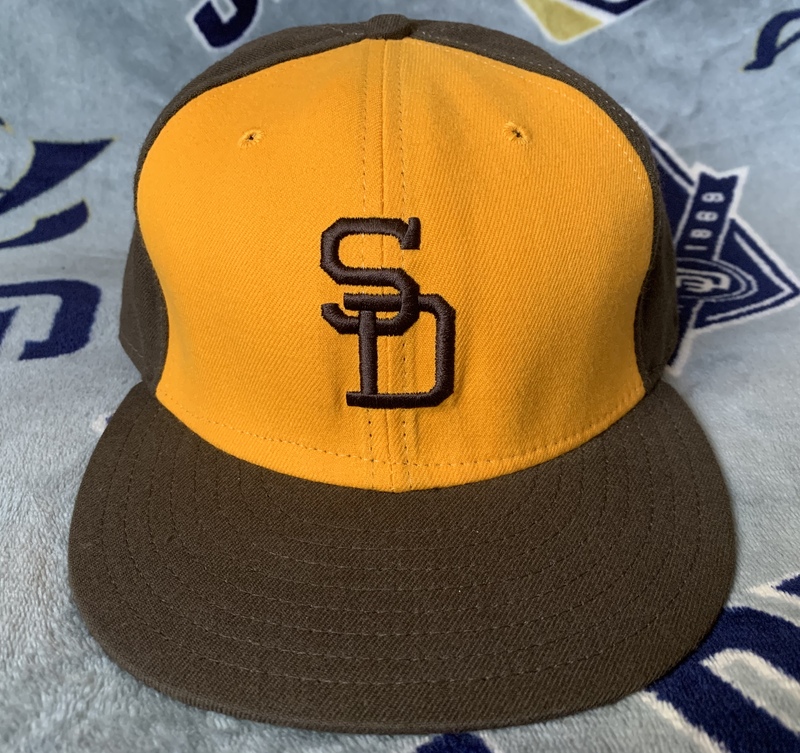 I know what you’re thinking…it doesn’t look like any cap the Padres have ever worn in their history except for a vague reference to the mid 70s. What gives? Here’s where things get interesting; it’s a remake of a TBTC remake gone slightly awry. Let’s dive in to some backstory. The Turn Back The Clock phenomenon was still something of a novelty in the 90s. While the practice has now become a staple in many teams’ yearly uniform rotation and has become a fan-favorite event, the practice of reaching back into your team uniform catalog didn’t reach critical acclaim until the mid-2000s. The Chicago White Sox were actually the first team to play a Turn Back The Clock game in 1990 as part of a nod to the end of Comiskey Park. 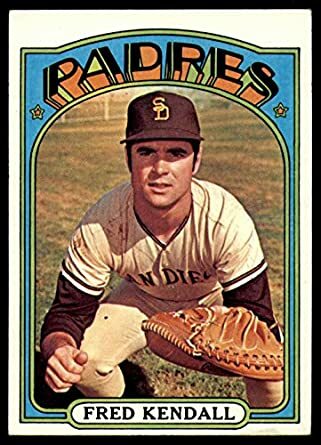 The practice soon caught on with other teams and our Padres were not immune to giving it a try, playing their first TBTC game against the California Angels (who also donned their ’78 best) at Jack Murphy Stadium. A little known detail to most laypeople was the practice of who made the jerseys for the one-off games; the home team had to supply not just their team but the visiting team if they wanted the opponent to play along in a TBTC game. The official uniform supplier of MLB at the time (Rawlings, Russell, et al) reserved first right of refusal for making the jerseys for the games. Many times the official supplier indeed didn’t bother and the task was taken up by other outfitters such as AIS, Ebbets Field Flannels, Wilson, and Mitchell & Ness. For this particular TBTC game Mitchell & Ness was tapped to make both the jersey and hat for on-field wear. I’m unsure if New Era (then and still the official hat supplier) was given the option to make the hat, gave the right of refusal, or simply opted to make the retail versions such as today’s example. So what exactly is today’s cap? I figure it must be a retail remake done by New Era at some point after the actual TBTC game was played, possibly a few years after thanks to the dating on the tags. This cap uses the “error” interlocking SD. Why is this SD called an error? When New Era first took a swing at producing the caps for the Padres of the early 70s their first examples had this version of the interlocking SD where the logo is elongated and an odd block is added to the S. This error looked to have been rectified before the start of the 1971 season though this version still appears sparingly in retail and fashion caps. The MLB Batterman still appears at the rear. This logo is rarely omitted from TBTC caps except in the rarest of circumstances, even for historical accuracy. The underbrim is proper kelly green; the sweatband most interestingly is black. The interior tags lead to difficulty in pinpointing the age of the cap in correlation to the TBTC game itself; these tags place the hat as being made in 2000-2003. Why would New Era wait a few years to remake a remake of a cap? Hard to say. It’s possible they didn’t catch wind of the M&N cap existing until later on and then decided on a remake. It’s also very odd that they’d want to remake a version of a cap with anachronistic issues, but I digress. The only place I’ve found this cap is on eBay. Second-hand market searching will be your best bet on trying to snag one of these oddities for your collection.